Most artists and art therapist know that failures and imperfect art are sometimes part of the creative process. But this isn’t always easy for our clients to sit with. They may still have self-judgment that comes up, feelings of shame, or emotional distress that is hard to regulate. Please keep in mind that I use the word “failure” here as a reflection of how clients sometimes feel about their art, not as an objective label. I’m referring to art that feels unsuccessful, messed up or ruined in some way, not good enough, not as intended, incomplete, etc. I would never use the word failure with a client in session because I don’t want to reinforce that label for them…and because I think every attempt at art-making is successful and valuable in some way! Of course I have certainly had my own artwork that felt like a failure to me. Sometimes that “bad art” is just part of the learning process as I work on improving my skill, sometimes it’s the result of just playing around with media and more process-focused experiences, and sometimes it’s a big frustration as a piece of art doesn’t go as planned. In my own art I’ve been playing with re-visiting artwork that seemed incomplete or unsuccessful in some way (strategy #10 on the list below), so the next blog post will explore that topic in more detail. So how can we respond in a therapeutic way to feelings of failure that come up around art-making? 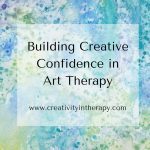 Our role as therapists is to create the space where a client feels most safe to engage in the art and then help them learn and grow through the creative activity. Sometimes we may want to help clients feel good about the art they are making, but sometimes we need to help them work through the uncomfortable feelings that arise. 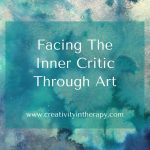 Below are some strategies that I use to address the idea of artistic “failure” in therapy. Keep in mind that your goals and areas of focus may be different for various clients and settings, so think about which approaches are most helpful to your own clients (or your own personal art-making). I’ll share both ideas for setting up a supportive holding environment, as well as responding after the art is in process. 1. From the beginning be clear about the intention of art therapy and give permission to make bad art. I tell all my clients that art therapy is not about making “good” art and that it doesn’t matter what the final art piece looks. The point of art therapy is to use the art to explore something, have another outlet to communicate things, practice a new skill, or express emotions. The resulting art sometimes looks good and sometimes it looks like an ugly mess. I remind clients that as long as they are engaging in the process, they are successful and have not failed. 2. Treat all artwork with respect. This one may seem obvious to most therapists, but some may be unclear about how to actually do this in practice. For example, keeping client artwork in a safe place, like a special folder or the medical record, and reminding clients of this, shows them that we consider the artwork to be important and valuable. We not only consider it to be worth keeping, we are also protecting it from being damaged or destroyed – whether by the client or someone else. Many art therapists will even retrieve a piece of art from the trash after a client has thrown it away. We also show respect for our client’s art by observing the process, taking time to witness the final piece, and finding something to explore and discuss in every artwork. When apply the same level of witness and then safe holding of the art to every piece of art that the client makes, we are giving them nonjudgmental acceptance. If the therapist picks and chooses which art pieces seem worthy of being saved or discussed, we feed in to our client’s potential self-judgment and sense of some art as not good enough. 3. Focus on the art process and meaning, not the product. The importance of process over product is frequently discussed in art therapy. However, many clients still express dissatisfaction with their final art product. The therapist can ask questions and make comments that shift the focus away from appearance and back to the process of creation and the artwork’s meaning. Explore what the client was expressing about their art, highlight personal choices that they made, and discuss the steps they took as they worked. If you feel the client needs reassurance about their artwork, point out how they were successful in things like conveying their personal meaning through the art, evoking an emotion, or learning to work with a new media. 4. Explore the feelings, self-talk, inner critic, and cognitive distortions that come up for the client. 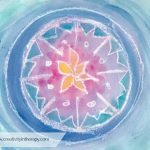 When negative thoughts and feelings come up in the art therapy process, we don’t necessarily need to reassure clients or help them feel better. Sometimes we need to accept and explore those feelings. Help clients to identify and share the negative thoughts that are coming up for them around their “failed” art. Depending on your approach, you could label this as negative self-talk and work on what they want to tell themselves instead, practice identifying and challenging the cognitive distortion, or take some time to dialogue with the inner critic. 5. Explore the client’s memories of artistic ability, failure to achieve, or expectations they have for themselves. When clients feel like they fail in the art-making, it can be helpful to explore the background and experiences that inform their feeling. I have had clients that shared stories of art teachers that told them they were no good at art or family members that compared them (negatively) to someone else in the family that was a “real artist.” Others have shared about the high expectations and perfectionism that they bring to everything in their life, and the struggle of participating in something like art that they don’t feel good at. Others may be carrying the weight of many experiences that have told them they are unsuccessful or not good enough, bringing this self-perception now to the art process. Some clients have also had success with art in the past, identifying as artists, but feel unsuccessful in their current art for some reason – the impact of mental illness and addiction, time away from practice, or frustration with the available materials in an art therapy group. Taking time to unpack their memories and experiences can help clients see how the past is continuing to impact them and work toward letting go. 6. 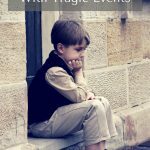 Discuss the value of distress tolerance and participating in something challenging. Many of us will naturally want to avoid things that we don’t feel good at. For some clients making art in therapy is going to feel really challenging and bring up distress. It is going to be hard for them to create art that they feel good about, no matter how much you reassure them. This definitely comes up at times in the art therapy groups that I facilitate. Recently some group members discussed the idea of using the art therapy activity as a way to practice facing a challenge, tolerating distress, and accepting imperfection from themselves. They did not necessarily enjoy the art-making, but they made a commitment, at least for those weeks in the group, to not avoid something just because it’s uncomfortable. 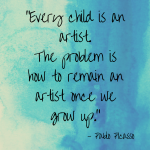 Although someone may continue to feel that the art product is a “failure,” they are still practicing an important skill in facing the challenge. 7. Start over. Sometimes we have to learn from an experience and then try again. Not everything that we do in life is going to be successful, and this certainly goes for art-making as well. Instead of assuming that we will never succeed and just giving up, we can start over and try again. Helping our clients to practice this in art therapy (and then apply to other parts of their life) can be an important lesson. Sometimes mistakes happen, sometimes we try an experiment in the art and it doesn’t turn out right, and sometimes we are still learning. 8. Focus on the process of learning something new. Especially when I am working with kids, I remind clients that it takes many years of practice to get better at any skill, including art. They need to be aware of where they are in the learning process, focus on how practice and effort can lead to more growth, and not compare themselves to others who have had more practice. In therapy, you might help support this learning process by teaching a new technique or helping the client correct something in the art. You can help clients apply this mindset outside of the therapy office by looking at other ways they have “failed” in the process of learning something new and then ultimately got better at it. 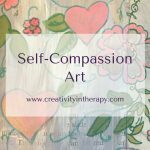 Are there other areas of their life where they currently need to have some self-compassion as they learn and allow themselves to make mistakes? 9. Provide the support they need in order to feel successful. Sometimes therapists may want to help their clients be as successful as possible in the art project, actively taking steps to minimize the likelihood that the client is going to feel like they failed. Some examples might be a child client that you want to help have an experience that makes them feel proud of their creation, someone with an intellectual disability who is learning the steps to complete a new project, or a group of elderly patients that come to art group to experience relaxation, socialization, and creativity. 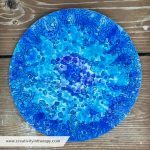 If your goal it to help clients feel successful in their art, think about projects that have clear steps, offer techniques that create interesting results, and help clients if they are struggling (but don’t forget to leave room for personal choices and self-expression in the art). 10. Revisit the art later to transform it into something new. If the art seemed like a failure at the time, maybe it can be transformed into something new later. I think that trying to transform old art is an interesting way to exercise creativity, push yourself to go further, and get yourself thinking outside the box. As a metaphor for things outside the art process, think about what it’s like to take an event that seemed like a mistake or a failure and find a way for it to become something new and beautiful. It’s also a way to practice the idea of working with what you have. If I have this piece of art in front of me, even if I don’t like it, how can I find a way to make the best of it and do something creative? I think it’s also fun and challenging to go back to pieces of art that were just experiments or ways of playing with technique and then find a way to develop them into something more. Revisiting and transforming my unsuccessful or incomplete art is something that I’ve been playing with lately. It’s definitely been challenging but has lead to some interesting art that I otherwise would not have created and helps me break out of my creative ruts. The next blog post will explore this idea more, so be sure to keep an eye out for it in a few weeks. Share your thoughts below! 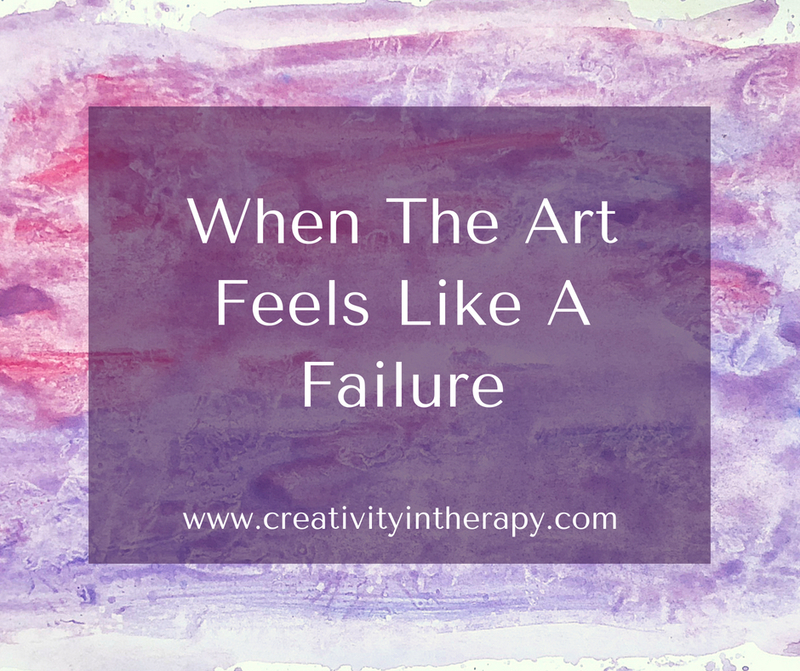 How do you approach feelings of failure in therapy or your own art? 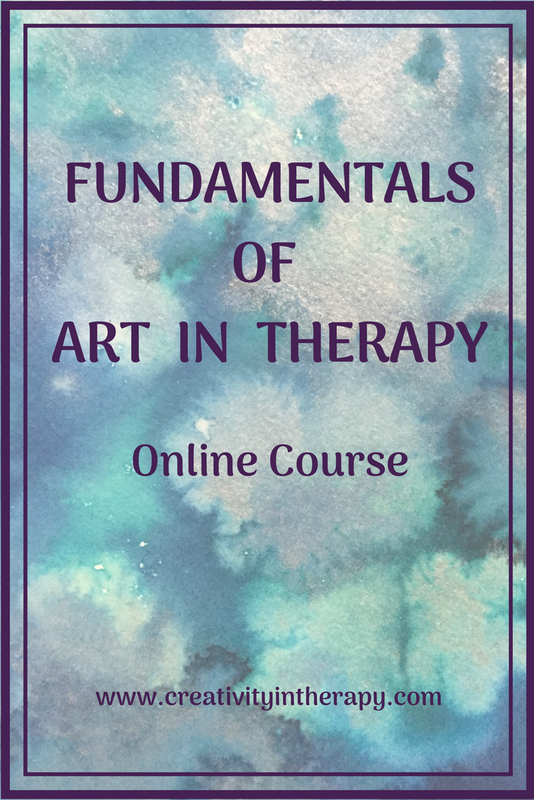 The online course Fundamentals of Art in Therapy will be available again this fall. If you would like to be on the early notification list (and have a chance to get a discount), be sure to sign up on the Courses page. This weekend I watched a documentary on the Mona Lisa. It seems that even Leonardo changed his most well known painting for underneath is found changes that he made to the original. The process of change is an important one, for in life it seems the only thing one can be sure of. Helping clients explore possibility is the framework I use when guiding in the creative process. Thank you for this important aspect of creativity. Failure is something I re-frame for the individuals I work with and your insight has helped me to better understand the process. I look forward to your articles. Glad you found this helpful and were able to get some insights to help with clients. That’s interesting to hear about the Mona Lisa – and a good reminder that even the great masters struggled with feeling that their art needed to be better or different at times. I found this really interesting, it reminds me of the importance of taking a meta position about those difficult feelings connected to the art, rather than automatically reassuring or making things ‘ok’. I also like the idea of returning to the ‘failure’ or difficulty, the object in art therapy offers the opportunity to return and have new thoughts as well as revisiting the original thoughts and feelings and change can be experienced in a very practical sense. Separating out issues connected to learning about art techniques and materials is also very helpful and can connect to perceived narratives for the individual about learning and change. Thanks for reading and sharing your thoughts, Claire. I’m glad you found it interesting. Excellent way to apply the challenges of art to everyday challenges that we all face and how we respond to them. This is so helpful — thank you! Glad you enjoyed it, Eileen! First would like to thank you for your amazing blog full of very clear and simple tips. It is always a pleasure to read your articles and learn from your approach. I’m a French art-therapist, and I love to have a point of vue from across the ocean ! I read this post very carefully, as I am often struggling with patients who are also self-depreciating their art. I found your input about accepting and exploring the negativity extremely interesting. But a particular sentence made me think a lot. It is: “Many art-therapists will even retrieve a piece of art from the trash after a client has thrown it away”. I thought: why would they do such thing ? If a client wants to throw something, I like to think of it as a full part of the process, and I accept it. Sometimes it is meaningful and I encourage it (like letting go of a negative part), and sometimes it also might show something about how the client feels about his work (not worthy of anything else than trash, or interesting during the time of the creation but useless after, or they don’t want to take the risk of anybody else seeing it if they don’t feel safe at home, etc.) In that case, we talk about it. I imagine that if I throw my own piece of art, I would feel betrayed if I find it in the folder during the next session. But then I thought, maybe it can help some clients feeling that we care about their work ? That we see something else in it, something that needs to be rediscovered/rediscussed later ? Have you ever experienced it and how did your client respond ? Or do you have exemple from other art-therapist who did it ? Thanks for sharing your reaction. I definitely agree that retrieving art that has been thrown away could be perceived very different by different clients. Most things in therapy are “it depends” and should be adjusted to what is best for that individual client…the same goes for this idea. As you point out, some clients need to be able to throw a piece of art away in order to let go of something. 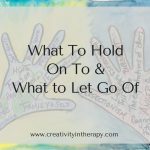 Some would benefit from being allowed to do so, some would benefit from processing and exploring why they feel their art is not worthy, and some may benefit from the gesture of the therapist retrieving it. And, actually, this discussion is making me think about some settings that don’t really allow for the therapist to keep the artwork. In that case, sometimes the client keeping the art or throwing it away are the only choices, so throwing it away may actually feel better to them than taking it home. Personally, I am not secretive about retrieving art from the trash, so I hope it’s not perceived as a betrayal. I will tell the client that I think their artwork is worth being saved and ask permission to keep it for them. (However, I would not do this if it seemed that the act of discarding something was part of their healing process) I typically don’t retrieve something that was more of a false start, like a client starting a drawing and then deciding to start over on a new page. Thank you for raising this question and bringing more nuance to the discussion. As always, we need to use our clinical judgment about what the client needs and what message our actions are sending. 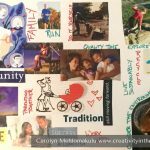 I liked so much this post, I could find very useful the many ways to be with others such as the wide possibilities to transform the approach with art. As in life we are always making several attempts to something. With all this points we can work with more clarity and most of all looking at the process, the attention and intention with the client. Hi Adriana – thanks for sharing your thoughts. That’s such a great quote!